It might seem obvious but lots of people let their jobs fall by the wayside when their normal schedules are impacted by the holidays. Keep your schedule up and plan for holiday events. It’s okay to make adjustments; foregoing your schedule entirely will likely lead to less profits and opportunities once the presents are opened and the New Year arrives. Even though it’s important to keep your schedule, it’s also important to take time off for the things you love. If you spend the holidays hunched over a keyboard blogging or working on assignments, you’re going to feel deprived. Instead, choose the things you love most and plan to enjoy them to the fullest. Just write them down and schedule them like any other event. With so much going on, it’s easy to let self-care fall by the wayside. Don’t. Staying healthy isn’t just good for your body, it also makes it easier to stay productive during the holidays. Eat a healthy meal between the gut-busting family dinners, get up every hour to stretch and get some water, and take time out for exercise. You’ll be glad you did. One issue freelancers face when it comes to keeping up with assignments or continuing the holiday job search is that often there are more people around during the holidays. Family comes to visit. Friends want to gather. Children are home from school. Make sure to prioritize your work for a certain amount of the day or week. Just set boundaries and close yourself off in the office for an hour or two and you’ll make great progress. If you know you’re going to have twenty people at your house or travel plans that last for two weeks, put your nose to the grindstone ahead of time. Land jobs early, plan to finish assignments early or at least get a head start on them and you’ll have much more free time when you need it. Plus, no one enjoys a last minute scramble to get things done. 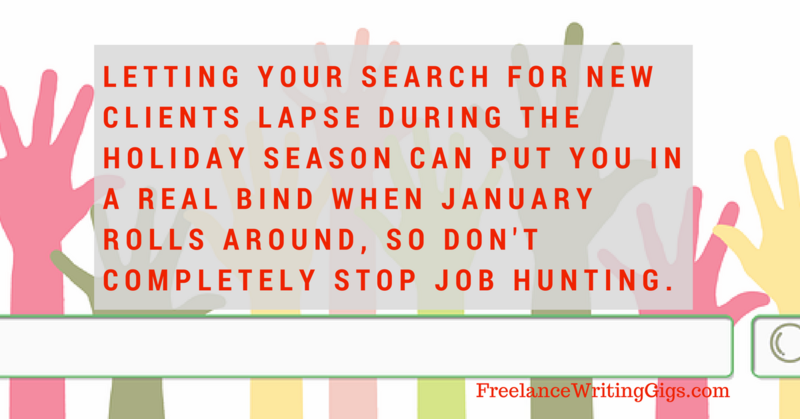 Letting your search for new clients lapse during the holiday season can put you in a real bind when January rolls around. Find jobs during the holidays by designating a part of your schedule for your job search. Dedicate yourself to, say, checking at least three ads a day in your field, sending out resumes, or spending two hours on Fridays hunting for jobs. However you do it, looking for work is an essential way to stay productive during the holidays. We’ve talked about how it doesn’t hurt to keep looking for jobs even though you have existing ones, and it’s even more applicable during the holidays. Think about it. The holidays are a crazy time, and the chances are that you’re spending a lot of money during this period. While you may have saved for this, you also might have a considerable amount of bills to pay come January – on top of your regular expenses. That’s a major reason we try to keep the job lists going during the holidays even though there may not be as many ads as usual. Platforms like Flexjobs, however, have even more options for their members, that is why we really recommend them to you guys. As you may already know, we’re part of their partner program, and they’re offering up to 30 percent off their regular membership rates by using code FWJPROMO. Great customer service (which can be rare these days). But, here’s the clincher this time of the year. Aside from the ongoing membership discount (code FWPROMO), Flexjobs is offering their members six stress-reducing holiday deals! From Fresh 20 to YogaVibes to ShareHolidays, you get discounts if you’re a Flexjobs member. Want to learn more? Check out the full list and details here. So, yes, if you want to make holiday job searching easier, then you really ought to give Flexjobs a go. If you work with other people, it’s important to touch base early about assignment and schedule changes during the holidays. Some people don’t travel when or where you’d expect; others take a large chunk of time off. 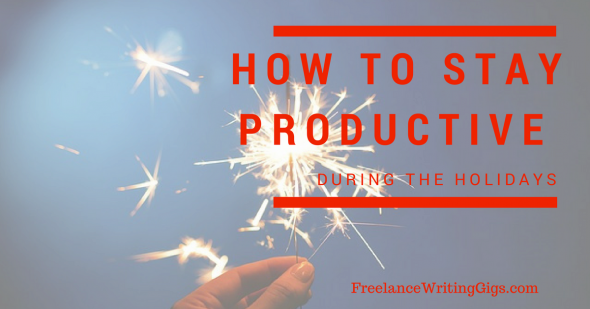 If you’re depending on other people to have productive holidays, it’s better to get in touch and make your expectations known. In the same token, if you’re having a hard time juggling your workload, talk to the people who will be affected earlier rather than later. Not everywhere you travel during your holidays will have reliable Wi-Fi. It can be hard to find jobs or submit assignments when you can’t get online. Check ahead of time to make sure that your holiday housing includes the internet. If it doesn’t, consider getting a Wi-Fi hotspot plan to go with your phone. Make sure to set up your assignments to save and sync remotely while you’re out on holiday travel too so that you don’t lose anything when you’re making use of someone else’s computer. If you want to have productive holidays, a place to work that helps you focus and get things done will make it happen. If you’re visiting family, check out local coffee shops or libraries to find relatively quiet places to sit with a laptop so you can get a couple thousand words written before returning to join the fun. If you’re staying closer to home, consider getting up early or staying up late to work — whichever works better for you. In that way, you’ll have a quiet workspace that’s distraction-free instead of one overrun with well-meaning visitors. One of the best parts of being a freelancer, blogger, or writer is that you have flexibility. Remote work usually means that you can easily take your children to visit their grandparents without having to give up valuable income. Start a holiday job search now rather than waiting until they get closer and look for flexible remote opportunities to enhance what you’re already doing. If you follow these tips, you’re sure to stay productive during the holidays. That means when the new year rolls around, you’ll be set with assignments, on track with your current projects, and better off in the bank account than you would be if you slacked off. Prioritizing work doesn’t mean letting the holidays fly by without having any fun – you just need to make adjustments and allowances for the holiday season. Nice article. helpful, well laid out tips.